Thank you for verifying your email address with me. My goal is to have at least one parent/guardian for every student I teach. I am almost there! One way I want to use this blog is to give parents ways to support student learning at home, while making sure the experience is as painless and stress free as possible. For your first task, I ask you to show the screen shot below to your son or daughter. 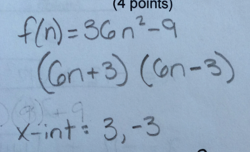 Ask if he or she agrees or disagrees that the "x intercepts" are 3 and -3. The hope is your son or daughter will say the student did not divide by the 6 that is in front of the "n," and the answer is actually 1/2 or -1/2. This is a really common error. p.s. If your child had math today they have an assignment called "Challenging Task" that is due next Friday, January 10th. It is great, yet challenging, practice for the midterm. Thanks for keeping us parents involved and telling us exactly what to ask!